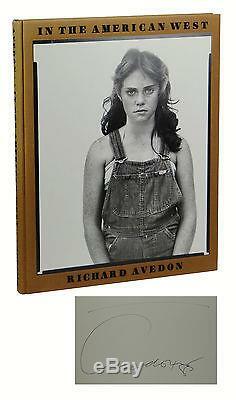 First Edition, First Printing Signed by Richard Avedon. Signed and inscribed to previous owners by Richard Avedon on the front free end paper. Near Fine, with slight fading to cloth on spine and light reading wear to several pages, in a Near Fine acetate wrapper with light rubbing. A lovely copy, signed by the photographer. The item "In the American West SIGNED by RICHARD AVEDON First Edition 1st Print 1985" is in sale since Saturday, October 29, 2016. This item is in the category "Books\Antiquarian & Collectible".